A volatile day for the euro vs dollar with the currency pair falling sharply early in the trading session, only to recover later, and ending the trading session as a narrow spread down bar, but with a deep lower wick to the downside, suggesting once again that the bulls are fully in control of this pair at present, and buying heavily on any downwards move. 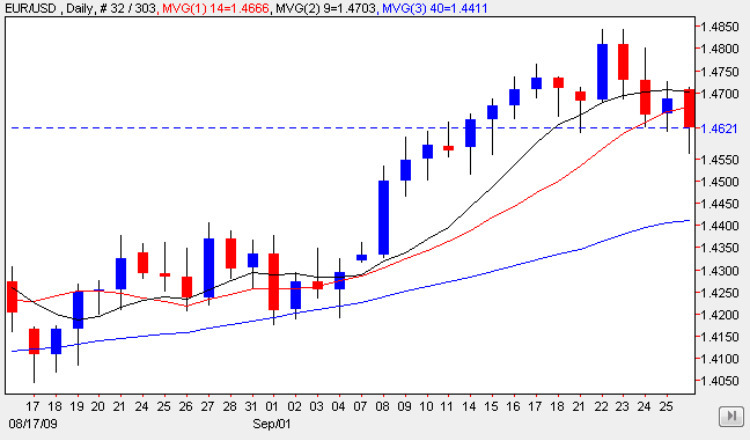 This technical view is further confirmed by the fact that the close of the session also found support from the 14 day moving average, suggesting that the bullish tone for the euro vs dollar remains firmly in place, and my initial short term target remains the same at 1.50, with a possible move higher in the medium term to 1.55 – as my granny always used to say – never buck the trend!! The key of course for any move higher will be when the euro vs dollar breaks above the recent top at 1.48, and once this is breached then we should see a run to the 1.50 level in the near future. In the meantime look to buy into the market on any dips, and for longer term trend trading set your stops well below the previous consolidation area at 1.42 or lower. A day of relatively minor fundamental news in Europe today for the euro vs dollar, with the only item of news likley to move the market being the CB Consumer Confidence data due for release in the US later in the day. The forecast is for a figure of 57 against a previous of 51, and if this forecast is correct, once again confirming the view that we are slowly moving out of recession in the US. The main reason this indicator is considered important is the size of the survey and the fact that it is considered a leading indicator of the future economy, with any figure above 50 indicating an economy in expansion.